The Lady is a Fraud . . . I never thought I'd go to Germany -- I or any of my family. I'm Jewish, after all, and namewise rather visibly so. (That was a conscious decision, btw, and I knew I'd made it correctly when Almost a Gentleman came out in 2003, some commenter on All About Romance commented how admirable it was that I'd written it under my own name. An odd business, isn't it, those expectations, perhaps changing these days, about romance authorship). Anyway, when I was a kid, the scars of the holocaust were too raw. But things change. The world changes, and how we see it changes too. It's with some surprise that I remind myself that this process is called history. A few years ago my nephew Dmitri married a lovely young German woman named Julia and moved to Berlin with her. And soon after I began hearing about what a cool, fun city Berlin was -- filled with vibrant, creative people. Dmitri took German lessons -- at the Jewish Community Center in Berlin. "It's like San Francisco," my friend rebel-techie Mitch Altman told me, "only if everybody you liked could afford to live there." Even Travel and Leisure magazine agrees that it's "easily Europe's coolest metropolis." And novelist Gary Shteyngart announces that that the "short, non-Teutonic folks are coming." History. Still happening. Cities change -- and in the case of San Francisco and its burgeoning rents, not so nicely some ways, either. So here I am, with my husband and laptop, at the breakfast table with Dmitri and Julia -- and four-year-old Maxine and year-old Cornelius -- in the lovely loft apartment they've just moved into. It's pretty far east, in a converted leather factory, so it's got nice brick walls and high ceilings. Not much around it. Yet. But happening neighborhoods keep springing up further and further east, where "the people you like can afford to live." I took a picture of graffiti proclaiming that this is "NewWeirdBerlin" -- I'll post it on my own webpage when I figure out how to download it. And while we were riding the streetcar to Kreuzberg (my generation's happening neighborhood, with a sizable Turkish now population as well) I should have thought of photographing the old socialist-looking building under renovation, with its banners proclaiming that what's "aus" -- out -- is now in. Of course there's more to history than "in" and "out," style and graffiti -- and in this city that's seen so much horror and suffering, that's been bombed and leveled, rebuilt, divided and sutured back together again, there's much to muse about. 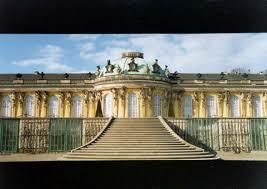 But today we've got to get to the new train station, to take a trip to Potsdam, where Frederick the Great built Sans Souci, his Versailles, or perhaps his happening neighborhood. Come to my own web site soon for more... history... and musings about how to chase after it. I've heard a lot great things about today's Germany. Beautiful landscapes, and castles. Tons of history there. Germany has a dark history,unfortunately, that marched right into the 20th century. Hopefully, this century they'll just decide to be a very cool place to visit, and leave the past where it belongs in the past. What moved me most about traveling through Germany (mostly Bavaria and up to Aachen along the Rhine) were the tactfully worded signs in front of so many churches(especially Cologne cathedral): "Rebuilt after a fire in 1944." My husband and I didn't have the heart (or stomach) to take the train to Auschwitz. Fascinating post, Pam. I've never been to Berlin, though I have a German friend who lives there. Although it's a country rich in history (both good and bad) being Jewish as well, I have not been able to reconcile myself to traveling to Germany voluntarily. I did visit Munich for a few days in 2000, accompanying a guy I was seriously dating at the time to the wedding of a good friend of his. I tried to focus on the beauty of the parks and the good food and the charming toy museum, and the people I met were all extremely nice to me; but I couldn't bring myself to visit the site of the 1972 Olympics where the Israeli athletes and their coaches were taken prisoner and assassinated. Germany remains a place that may always have an ambivalent place in the hearts of many of us. I can respect Lee's comment about leaving "the past where it belongs in the past" -- but Jewish people often invoke a different motto: "never forget". Sometimes, when you leave things in the past, the unfortunate tendency is that they become forgotten and it is all too easy for history to be repeated. I agree with Amanda, Lee, that you can't simply leave the past in the past -- in fact, I, and many of the hoydens, and other historical authors have written about this in various posts on this blog, when we've shared our experiences trying to portray some of the reality of, say, Regency London. And it was in this spirit that I wrote this post. The Germans, btw, do not leave their past in the past -- and I hope to write more about how it is to experience what I think is their very moving effort to do a very difficult thing. Though I have, also seen some of those "tactful" signs as well, Lynna. Wonderful post, Pam! I haven't been to Germany either, but a close friend lived in Berlin for part of college and again right after. He loved it, particularly for the theater scene (he was studying theater and later worked as a translator in a theater in Vienna). And other friends of mine, one of whom is an opera singer who was working at one of the opera houses, recently spent several years there and had their first child there. But I am a rococo art buff, and Sans Souci is spectacular: the rooms sumptuous but witty, intelligently and coherently conceived. I only know the gardens at Versailles and not the rooms, but I suspect that they're far less... well, intelligent. I must learn something more about it, and about Frederick the Great too (who wasn't so great all his life re rights for the people, I gather -- but what eyes he had). I haven't been so astonished by the taste behind a famous house since we visited Frieda Kahlo and Diego Rivera's house in San Angel, Mexico City, twenty years ago -- or more. RE: the unhappy memories of Nazi-era Germany. I empathize as a black American, whose history in this country is--and still can be--painful and degrading. I've learned to look back while facing forward, and find a richness in a dark past to draw hope and empowerment from--because we've come so far from a time when senseless, public prejudices were the norm rather than the exception. To lighten the mood, I am envious! Berlin is right up there with Paris and Vienna for me. Potsdam is right up my alley, as I have an odd fascination with Kaiser Wilhelm II. I grew up in Heidelberg, Pam, and fell in love the Rhine River castles! It was an enchanting place for a little girl who knew nothing about WWII. I have since visited Auschwitz, and "Sophie's Choice" and "Schindler's List" are the most haunting movies I've ever seen. But I still marvel at medieval Germany-- or its brilliance and amazing historical stories. But I do know, la belle, that you'd love the museum we visited yesterday. The Kunstgewerbemuseum (museum of applied arts) is an exquisite collection of mostly European craft objects -- the late 19th and early twentieth century stuff is mindblowing. As is, in fact, the medieval stuff -- but we were too ignorant and overwhelmed to really take it in. Still, I can imagine how wonderful it must have been, Kathrynn, to be a child in Heidelberg. Super fun! Germany is SO on my list of "must see" places. I babysat for a German film director my senior year of college (she was a visiting professor and I was the only person on campus her 3 year-old liked, LOL! ), and I'd love to see her again. So far what we're most loving in Berlin are the museums and the very laid back artsy good life. Lots of little kids and I haven't seen one au pair -- it helps that the state subsidizes childcare. Today's absolutely amazing museum is the Bergruen collection -- mostly Picassos -- with an inspiring story to go along with it. Speaking of what interests members of this group! . . .have you seen the bust of Nefertiti in the Berlin museum's egyptian collection? I so want to see her. The controversy about her disappearance from history all of a sudden (she may have changed her name, assumed a male disquise and become the regent ruler after her husband died) has always fascinated me. We're going to that museum today, Kathrynn. We set out for Nefertiti yesterday, kate, but didn't make it either. Too much at the Pergamon Museum nearby -- like the whole Pergamon Altar (the size of a major house) imported from Turkey and rebuilt in a Berlin museum. As my upcoming book, The Edge of Impropriety, has its hero and heroine meeting cute among the Elgin Marbles, I found much to occupy myself here.